I was feeling a lil lousy yesterday—tired of the stress of work, feeling overwhelmed and non-motivated, and then I read tweets by a man named Troy who lives in Port Au Prince. He talked of sleeping in his driveway, aftershocks (even one this morning at 4am), having very little food and water and the horrific smell of rotting decomposing bodies on the streets. I realized I have no idea what suffering really is. I realized I needed to immediately snap outta my b.s. funk and get focused. I, no, WE have to be strong, on point and vigilant for those who can’t right now. We can argue and debate all day about the merits of tithing, of not fornicating, of praying at least 6 times a day, but this here my friends, this is our moral responsibility. We have to remain steadfast and spiritually, politically and financially locked-in with those less fortunate. Haiti needs us! So let’s buck-up. 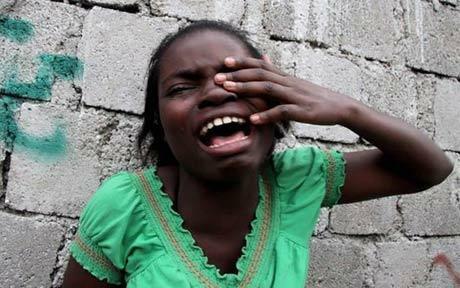 @thehotnessgrrrl: Help Haiti Earthquake Relief Donate $5 by texting YELE to 501501 right now! Let’s make a difference! The organiz behind 501501 text is YeleHaiti- founded by Wyclef Jean. Its LEGIT! Clef has wrkd tirelessly for yrs to help Haiti. @thehotnessgrrrl: Haiti is the size of Maryland, but with over 9 million residents. Tahana (Facebook): Thanks to Haiti the U.S. expanded via the Louisiana Purchase. L’Ouverture Toussaint of Haiti is seldom appreciated, but in the age of revolution in America he rose to leadership & intensified & defined the anti-slavery movement, causing Napoleon to sell Louisiana for a song rendering certain the final prohibition of the slave-trade by the US in 1807. (Du Bois, p. 70). We owe Haiti– SO LET’S DONATE! @DiggsWayne – When #ghettoremedies is trending above #Haiti we have a real problem. A real big problem. @faraichideya – Read my new blog post: Haiti IS Cursed–By Our Ignorance. @ralphmarston Live every day in awe of the fact that you’re alive. Read novelist Edwidge Danticat’s thoughts on the Earthquake in Haiti. She was born and raised there until the age of 12. Here she talks about the devastation—personal and political.